Put simply, we love the outdoors and we want you to love it too. We want you to breathe in the seasons. We want you to find the adventure that makes your heart pump. We want you to explore. In your own backyard. On another continent. It doesn’t matter where, just that you’re playing outside. For our family and Trail House staff, this isn’t a tagline, it’s our baseline. We know that the better prepared you are, the better your outdoor experience will be. We choose quality gear and apparel that is designed to enhance any outdoor activity from walking to camping to rock climbing. We stand behind the products we sell so you can have confidence in the gear you purchase. We strive to provide exceptional customer service – the kind you can’t find online. From clothing, sunglasses, backpacks, sleeping bags, tents and climbing gear to an extensive array of both technical and casual footwear and more, each product has been carefully selected for its durability, functionality, brand backing and environmental footprint. Our staff is extremely knowledgeable and very well-trained. Their own outdoor activities lend firsthand experience for product guidance and will help you to make buying decisions that will maximize your own experience. 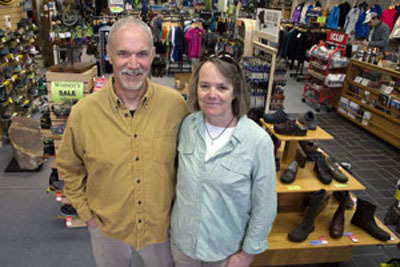 In addition to apparel and gear, we’re an excellent resource for local and regional hiking, biking, camping, rock climbing and paddling maps and guidebooks. Have a question about where to start or a specific trail? Chances are good we’ve been there – or know someone who has – and will be happy to share our experiences and recommendations. The Trail House is heavily invested in the Frederick community, the place that we call home, but attracts customers (who soon become friends and often fellow adventurers) from Maryland, Virginia, West Virginia, Pennsylvania and Delaware. The Trail House combination of product quality, personal experiences and professional knowledge has proven to have a long-lasting value that can’t be defined in dollars and cents and we hope you’ll come to see us soon. We are strong supporters of the Downtown Frederick Partnership and assist with trail maintenance in Gambrill State Park and the Frederick City Watershed. We support Friends of Cunningham Falls State Park and serve on many civic and outdoor-specific organizations and committees. We live our brand and hope that you will too. The Trail House is surrounded by a great variety of locally-owned shops and restaurants and there is plenty to do in our charming downtown district. We look forward to having you stop by!